Hey there! G.P. 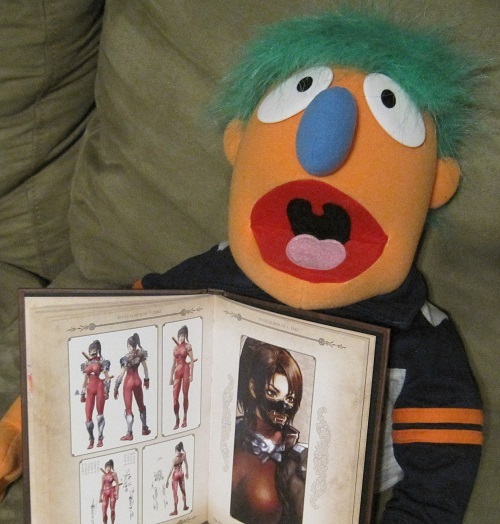 the GamerPuppet here. You know Cary, right? He reviews a lot of stuff here. Mostly, he prefers playing family friendly, silly colorful titles like Kirby, Mega Man, or Mario. That’s why he’s a great fit for reviewing games on this site! But sometimes he likes to play games that are a little more grown up, like Phoenix Wright or Metroid. 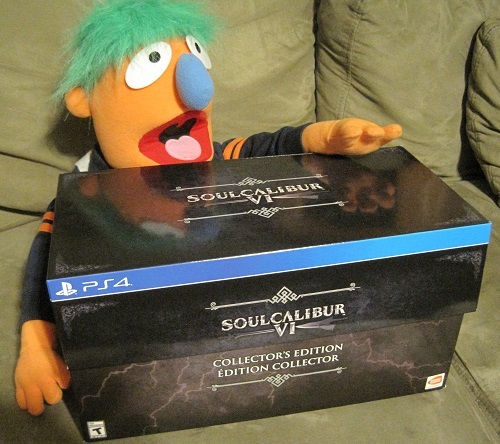 Another more ‘adult’ series that Cary likes is Soul Calibur from Namco. It’s a 3-D fighter that looks great and is very accessible to newbies and pros. 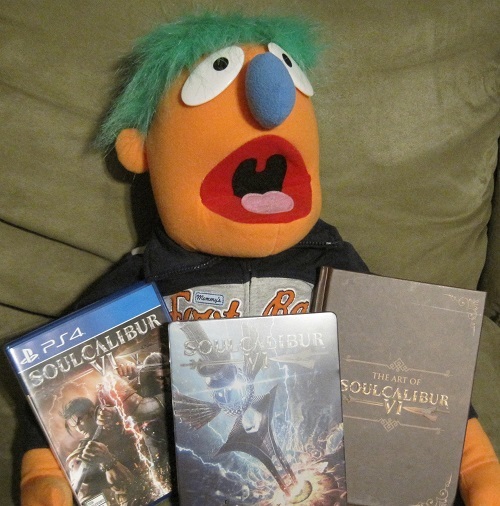 Recently Soul Calibur VI came out and Cary got the Collector’s Edition, so here’s pictures of me unboxing it! Here’s a closer picture of the box. It’s a big huge honking box, too! Three of the things you get inside are the game (of course), a steel case, and a hardcover artbook. Inside the steel case is a soundtrack. And here’s a peek at one of the pages in the artbook, featuring one of Cary’s favorite characters, Taki. Cary wishes the artbook would’ve been a little bigger, but it’s still pretty nice. The last thing you get in the box is what takes up most of the space, and is why the box is so big! It’s a statue of Sophitia, another one of the main characters! 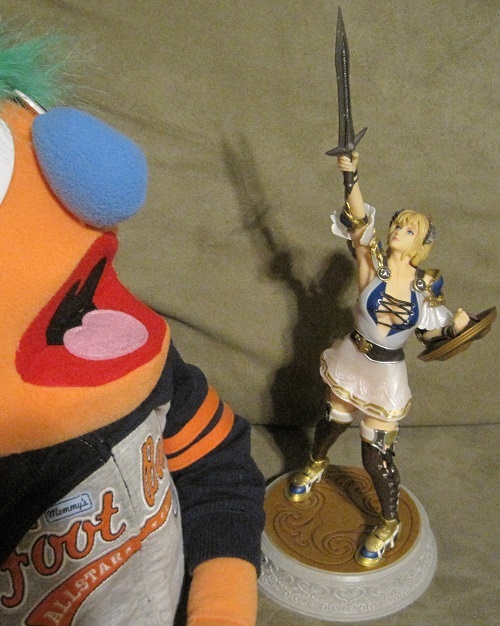 Cary wished the statue would’ve been of Nightmare or Taki, but Sophitia is still cool. Here are some impressions from Cary about the game: If you were sad that Soul Calibur V didn’t have enough single player modes, well you’re in luck with VI. There’s a great big story mode featuring characters you’ve created, as well as another story mode featuring all the other characters in one great big timeline! Character creation mode is back, which was always Cary’s favorite and he ended up spending more time with that than fighting, making it more of a dress up game for him. You can choose all sorts of races to make, from humans, elves, horned people with tails, lizardmen, skeletons, zombies, robots, and more! But the rest of the character creation looks to be just like V. Cary’s favorite Soul Calibur characters are Nightmare, Taki, Cassandra, and Sophitia. Who are your favorites? Let us know in the comments. Later! I’ll definitely be picking this up in some form or fashion, but now that I see this deluxe edition, I may just spring for it. The art looks great! 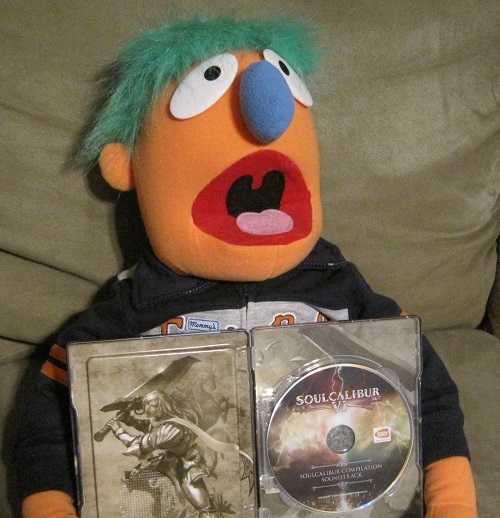 That’s some collector’s edition. Last Soul Calibur I played was probably the first on Dreamcast. Or, I think I played the one on original Xbox too. I think it had Master Chief in it, so that would be my favorite.